Published By – Warner Bros. Music, Inc. Given away free with the December 2018 issue of Uncut. Cover mount CD included with the December 2018 ("TAKE 259") issue of Uncut magazine. Magazine front cover displays - Free! 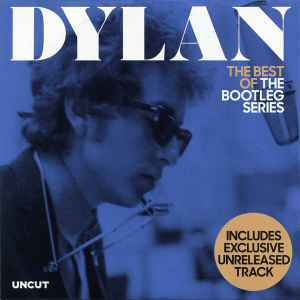 12 Track Dylan CD Includes Exclusive Unreleased Track. Magazine (page 75) Exclusive Track! shown as Track 8 - You're A Big Girl Now. Released in a printed card sleeve. No timings are shown on CD or sleeve. DECEMBER 2018 appears on the printed side of the disc. Catalogue number UNCUT 2018 12 appears on the rear of the sleeve. While the notes list "Pretty Saro" as "unreleased," I surmise now that Uncut was counting on its customers to see the track from the upcoming "More Blood, More Tracks" as the "exclusive unreleased track." As I see it, Uncut was misleading. Buyer beware: There are no "unreleased" tracks on this disc. All 12 selections were previously released on official Bootleg series discs. Uncut tricked me into thinking I was getting a disc with a track that had not been released elsewhere. The song "Pretty Saro" is described as "unreleased," but that was only prior to the release of Volume 10 in 2013.